Darlings, if you know anything at all about me, you are aware of the fact that leaving the house with nothing but pennies in my pocket would be a mortal sin in my book. After all, what is a girl to do without a half-dozen lip glosses to keep her credit cards and other essentials company while on the go? Nevertheless, I thought it would be a fun way to introduce all of you to…les contents of my handbag. Since April 2010, I have been asked numerous times to participate in this peu activity; and finally I am – better late than never right, my loves? Let us start with le handbag itself. My current carryall is mark’s I’m No Slouch Bag. It was love at first sight when I spotted this bag on mark’s website; thus when mark offered to send it to me, I was thrilled. Though the bag is tres glam Online, in person it is even more so. The black and bronze tones whirl and twirl amongst one another creating the perfect shimmery shade for fall – making it versatile enough to accompany you on an afternoon shopping excursion, or chic evening out with the girls; but it was the shape which truly reeled me in. The well-constructed folds create an avant-garde, origami-inspired aesthetic; while the relaxed style creates a sassy slouch that boho belle extraordinaire, Ms. Serena van der Woodsen herself, would highly approve of. Final word on le bag? J’adore! Let’s move on, shall we kitty cats? As they say, “The handbag is an extension of the woman’s personality”; and the contents inside say quite a bit about who she is. These are the items that you will find in my handbag from day to day. ♥Oliver Peoples Chelsea Sunglasses: I was quite apprehensive about ordering these in the beginning, as the frames are so large; but they are now an obsession of mine – they provide instant glamour to any look, and make me feel as if I’m off to attend Woodstock! ♥Mossimo Wallet: Benjamin Franklin’s quote, “A place for everything, everything in its place” is the ideal way to describe this wallet – it is perfection. ♥White Diamonds by Elizabeth Taylor Perfume: You can’t help but to sparkle when wearing this scent! ♥mark Glow Baby Glow Hook Up Lip Gloss and Shine Tubes Hook Up Lip Gloss: The hook up connector allows you to connect two different shades, so you can carry multiple colors in a more compact fashion. I’m currently toting around Peek-A-Boo, Sweet Talk, Buttercream Brioche, and Sugared Almond. They smell yummy and look gorgeous on – plus they’re long-lasting! ♥16GB iPod nano: In the past, whenever I have left the house without this, I end up being stuck somewhere for hours on end with nothing to do; therefore, it now goes everywhere I do. ♥BlackBerry Curve 8900: One of my BFFs. And no, I’m not joking. I would be lost without my BB! ♥Les Liaisons Dangereuses: Though a heavy addition to le bag, I never leave home without a book – it is the perfect form of company to fall afternoons spent lazing about a park bench with a Pumpkin Spice Latte close by. NOTE: I may have accidentally forgotten to include my beloved iPod and BlackBerry in the aforementioned picture; therefore, let's just pretend that they're both camera shy and leave it at that...agreed? There you have it, lovers; the inside scoop on the contents of Café Fashionista’s handbag! I now challenge each and every one of you to allow us all a peek inside your handbag. After all, there is no better way to get to know a glamorous gal than by gazing into the depths of her purse! I love this post! :D Peek-a-boo at your bag! haha! Awesome! My purse is usually a little messy :P I'll have to post the contents of my purse anyway! How sweet...hmm..mine would have a ton of junk I need to discard. Love the post! Oooh I love your bag, happy weekend lady! Ah, I am unhealthily attached to my BlackBerry, too, although I have the Storm. My tote's gotten so messy, recently, I really need to clean it out! This is a fun post and I think I shall do the same! :) I love that you have a book and perfume...I love taking a book with me if my husband is the one driving or for my lunch break at work! Sometimes I dont have a little bottle of perfume and wish I did! LOL that your ipod and blackberry are camera shy! I always have my ipod with me! Love the bag though...the shape and the color! Funny thing, I read that book my freshman year of college. Small world. i love these kinds of posts! and that's essentially the contents of my handbag too!! Yikes. I'm far from glamorous and I'm much too shy to show the contents of my bag. Hahaha! Love that color of your bag! So rich and elegant. Your bag is quite glamourous. Loving the mark hookups? Hmmm never tried but all your suggestions seem to make it to my want list and so happy they do. I always need lots of lip stuff in mine too. Such a cool hand bag. Great post! Which reminds me that I was tagged to do one too...hehe. 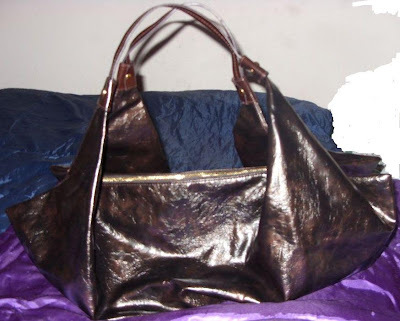 ;) Love the black and bronze tones on your bag. Perfect for Fall! More goodies from mark, love it!! Glad to know that bag is so fab in person... I'm carrying an Avon bag that I am in love with! I don't have a camera to post my handbag contents, so I will provide a peek-in-words... planner, book, hand cream, cell phone, ipod, sunglasses, wallet, and cosmetic case that always includes some mix of lip gloss, lip balm, bandaids, vitamin e oil, bobby pins and a hair elastic. Isn't it amazing how much a fabulous wallet helps your peace of mind?! Totally relate on the blackberry front and on les liasons dangereuses! I picked it up this year because I wasn't taking a french class and didn't want to lose the langugage and I've been reading it in my spare time ever since!! Aw, what a fun post! It's always fun to see what's in someone's bag, as that opportunity doesn't usually present itself! OK..I confess mine is full of candy at the moment. I had to volunteer at the lib. today..so I crammed it with some halloween candy to get me over snack time. Still a lot left. & lip gloss, lip balm and a checked out a book "what girls keep secrets about". something like that. It is so cute and so you! I love that you carry a book too! Mine is such a mess at the moment, but I typically alternate my bags out. :) did you give this one a name yet? I just feel like i got to know you better. 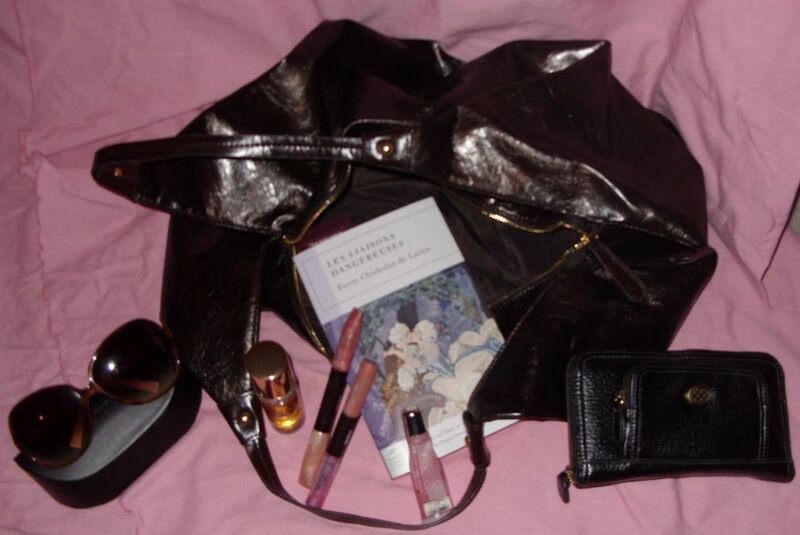 My handbag at the moment has a novel, 3 tubes of lip gloss, my wallet, my flash drive and some stuff that shouldn't be there like pieces of paper i jutted my thoughts on. You are uber-cool Erica and thanks for your comment on my last post. Such an awesome bag. I have something thats more of a lunch bag that I got from Target. Its cute and has flowers patterns on it. I like how it fits over my shoulder and usually, it I don't have a huge bag I wont carry a huge amount of stuff in it. Just the basics, like my wallet and my honey lotion & lip balm set. Those shades are so cool. I collect too much stuff in my bag. I need to clean it out daily. Very nice bag, Erika! Love the style! Thanks for let us peek into ur purse:) Hope ure enjoying the weekend! I love the way that your bag is so stylish inside and out. The inside of my bag is just a big mess of old reciepts and just about everything but the kitchen sink. The bag is simply gorgeous. I love how chic it is, but can still fit a lot into it. Also love those sunglasses. I love 'what's in my bag' posts. I'm not very interesting when it comes to my bag contents because I'm always switching between them (and forgetting this!). Nevertheless I always try to carry a mirror, lip gloss, money cards , a pen and my phone. And on that note... I so need a new wallet! that bag is gorgeous and seems to fit a lot - love that! I love your bag, and I take about the same. And this post is very well-written! i occasionally carry books in my bag too. it's nice to have something to read. i need a new wallet--yours is cute. thanks for sharing your bag! I love that you carry a book in your bag! I always do and find it so handy. Loving all your descriptions- thanks for sharing the awesomeness of Cafe Fashionista's bag. I love your bag, dear! So chic and unique. And you do carry the essentials... Your bag is in much better shape than mine! i love posts like these. how nosey of me!! I love these posts, Erika! I always like to see what everyone else carries around. :) I'm loving your sunglasses and your bag! I sell Avon and of course mark products and I am glad you mention the bag. I saw it and was like wow but I wasn't sure if it looked as good in person as it does in the brochures. I may just have to get it now. Aren't you lucky? What a stunner! I always love these type of posts! Your bag is very unique and you haha. I can't believe you carry multiple glosses lol! It's also surprising to me how many women carry books in their bags. I love these types of blogs... it's such a great (and fun) way to show your personality!